I was very lucky to have caught the second last performance of Silence before it concluded its world premiere run at the Grand Theatre. Trina Davies’s play is an unusual, beautifully written biography of Mabel Bell, née Hubbard (1857-1923), wife of Alexander Graham Bell (1847-1922), inventor of the telephone. It receives a gorgeous production from director Peter Hinton and his design team that for the most part emphasizes the poetic nature of Davies’s text. This is the story of a remarkable woman and provides an ideal vehicle for the immense talent of Shaw Festival favourite Tara Rosling. The fact the one thinks will provide the central paradox of the play is that Mabel Bell was deaf. One thinks how ironic it must have been for the inventor of a device that immeasurably increased mass communication across the globe to have married a woman who could not hear him speak. Luckily, Davies realizes that such an irony only supplies a very superficial view of the relationship between the Bells. She digs so deep into what unites the two that the historical facts of their relationship become part of a general poetic meditation on communication in general and the place of human beings in the world. We first meet Mable Bell (Tara Rosling) when she is at home at her new family residence Beinn Bhreagh on Cape Breton Island, Nova Scotia, looking for the point of light of her husband’s cigar as he bobs about in the waves of Bras d’Or Lake. 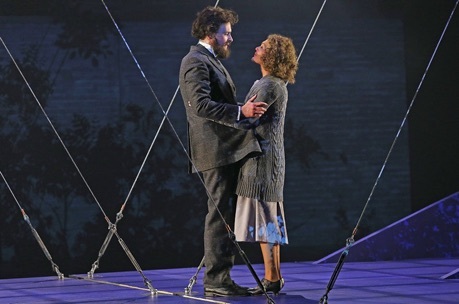 From the very first lines of the play, Davies makes “waves” the play’s central uniting metaphor which will come to refer to sound waves, waves of air and vibrations of emotion. 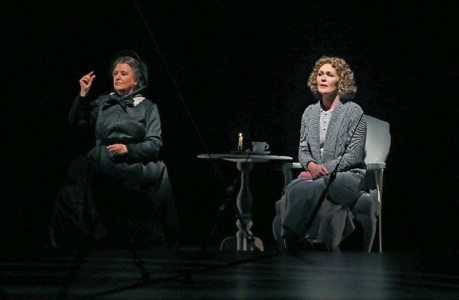 As depicted in the play, Mabel Gardiner Hubbard was brought to see Alexander Graham Bell (Graham Cuthbertson) because he was renowned, as were his father, grandfather and brother, for his work in elocution and speech. Bell was famous for his ability to teach the deaf to speak. Although American Sign Language had already begun to emerge in 1817, it was not yet the preferred method of teaching deaf people to communicate. Mabel had begun life as a hearing child but became deaf when a near-fatal bout of scarlet fever brought about perforated eardrums and scarred middle ears. Mabel’s proud, socially conscious parents Gardiner Greene Hubbard (Michael Spencer-Davies) and his wife Gertrude (Suzanne Bennett) had already educated Mabel in Europe and sought out Bell to help remove the imperfections in the English that Mable could already speak. She was already adept as a lip-reader and and could lip-read and speak several languages. The Hubbard’s were preparing for Mabel’s debut in society and hoping she would make the lucrative match that had so far eluded Mabel’s older sister Roberta (Madelyn Narod). Mabel is at first averse to Bell’s literally hands-on approach, asking her to feel his throat as he speaks to learn how to imitate a similar placement of tongue and jaw. Soon enough, the Bell’s admiration of his pupil’s beauty and brilliance turns to love. Hubbard already had an interest in the education of the deaf since his own mother was deaf. A patent lawyer, he is intrigued by Bell’s notion of the telephone, which for Bell is simply the conversion of sound waves into electric waves, and Hubbard becomes the principal investor in Bell’s research. What Hubbard and his wife are not pleased with is Bell’s desire to marry Mabel. Without the money his invention, if successful, would bring, they see Bell as little more than a poor, socially inept teacher. Soon Bell’s invention and successful demonstration of the telephone becomes a prerequisite for Mabel’s hand. As we know Bell’s first telephone call made on March 10, 1876, in Brantford, Ontario, was a success. So was his public demonstration of the telephone at the 1876 Centennial Exposition in Philadelphia which brought him world-wide fame and led to the formation of the Bell Telephone Company in 1877. Mabel and Bell married that year and one might think the story was over. But it is not. Davies’s play is not merely about Mabel gaining a husband but about her finding her own calling beyond marriage and motherhood. Tara Rosling gives an outstanding performance as Mabel. We can see that she first finds Bell off-putting and unmannerly. But, gradually, Rosling reveals how Mabel comes to see Bell’s eccentricities as part of his genius, especially since she perceives that his training actually does help her improve her speech. A signal moment in the play occurs when Bell shows Mabel how she can hear piano music if she puts her head to the lid of the piano. When he plays Chopin the sound waves magnified by the lid carry into her inner ear and Rosling beautifully shows how Mabel blooms with delight. Yet, Bell loves Mabel before she is willing to say she loves him. And much of the first act concerns what will make both Mabel’s parents and Mable herself accept Bell as her husband. In the second act we discover that life with an inventor is not easy. His life devoted to teaching and his head full of other inventions, Bell is an inattentive husband. Davies has devised a clever way of showing how Mabel can tune Bell out if she wishes to. Since her “hearing” other people speak depends entirely on lip-reading, Mabel simply turns her head away and the character continues to speak emphatically but silently. Rosling uses these moments to communicate a wide range of emotions from irritation to despair and sadness. Graham Cuthbertson portrays Bell as such a dedicated teacher that it is believable Bell should be so unfazed by his invention of the telephone and annoyed that it takes him away from his students. Cuthbertson shows that Bell as sincerely plunges into love as into all his many projects, but we see before Mabel does that a focus on her will not be a main priority as it was not before they were married. As Mabel’s father Michael Spencer-Davies is almost unrelievedly stern, depicting Hubbard as a man more concerned about money and his own status than anything else. Fortunately, Suzanne Bennett as Mabel’s mother, who begins by seeming even more forbidding than Hubbard, carefully shows how Gertrude softens by degrees towards the socially awkward young man who loves her daughter. Madelyn Narod’s whiny portrait of Mabel’s older sister is not very attractive. The character’s sole purpose seems to be to present a selfish, narrow-minded counter-example to Mabel’s greater intellect and depth of feeling. Catherine Joell Mackinnon, an actor, filmmaker and ASL coach, begins as a mysterious figure who signs what Mabel says when she is alone. Later, she is introduced as Eliza Bell, Alexander’s mother, who was deaf but also stopped speaking when one of her young sons died. Once she takes on that character, Mackinnon becomes a figure of stony isolation. Perhaps the two best scenes in the play are Bell’s attempt to introduce his bride to his mother where we can clearly see that what Eliza signs is not what Bell interprets in order to spare Mabel’s feelings. That scene, however, is followed by another where Mabel herself tries various approaches toward making contact with Eliza until she does reach a breakthrough. The tensions and emotions of Eliza are clear both through the expressivity and beauty of Mackinnon’s signing even if we do not know ASL. As happens sometimes with director Peter Hinton, Silence tends to be over-produced. There is no particular reason why Michael Gianfrancesco’s set has to open its two facing walls to a grinding metallic sound. It’s a great stage effect but without any metaphorical value. The play has already established that Mabel understands people through lip-reading, so there is no need part way through the action for Michael Spencer-Davis to set up a modern video camera focussed on Graham Cuthbertson’s lips to project them on the back wall when Bell is speaking to Mabel. Hinton also has the habit of having actors not appearing in a scene wander slowly about the set as if in a trance – a procedure that would be interesting visually if it had any meaning. 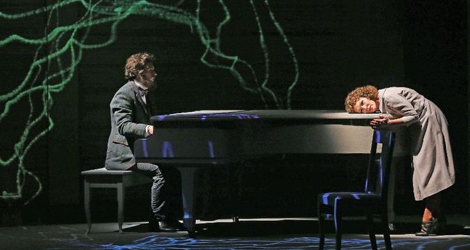 Nevertheless, one admires how Hinton has carefully linked Beth Kates and Jeff Pybus’s lighting and projection cues and Richard Feren’s sound design with the onstage action. Most remarkable about this play developed through the Grand’s COMPASS New Play Development Program, is how Trina Davies is able to frame the story of the Bells as so much more than a biographical drama. At first we take the title Silence to refer to Mabel’s deafness, though when we first meet her we she is already coping quite well with the world. She, in fact, can make it go silent when she wants to simply be looking away from people. As the action progresses we see that Mabel’s happiness depends on Bell’s presence since without seeing his face she cannot know what he thinks or talk to him. His unthinking neglect of Mabel plunges her into another kind of silence of isolation. From Mable’s encounter with Eliza we also see there is a third form of silence in the form of death where someone to communicate with is taken away forever. These forms of silence paired with the many forms of waves, natural and mechanical, that communicate so much in so many ways form a rich metaphorical structure which Davies has woven into the lives of the Bells. While Londoners are lucky to see it first, Silence is such a beautiful, thoughtful play that one hopes will go on to further productions across the country and beyond. Photos: (from top) Graham Cuthberson as Alexander Graham Bell and Tara Rosling as Mabel Hubbard; Graham Cuthbertson and Tara Rosling; Catherine Joell Mackinnon as Eliza Bell and Tara Rosling as Mabel Hubbard. ©2018 Claus Andersen.